Recognizing and honoring heroes is an essential component of the national identity. The list of our modern heroes includes Jinnah, Iqbal, Dr. Salam, Abdus Sattar Edhi, Asma Jahangir and Noor Jahan. As we go back in time, more heroes like Sir Syed Ahmad Khan are recognized. Going further back in history, for example in the case of Punjab, one finds great Sufis, Sikh Gurus and heroes like Dulla Bhatti who fought for peasant rights against Akbar, the mighty Mughal ruler. The heroes are remembered in epics, in folklore, by making monuments in their memory and naming places after them. In the case of Pakistan, not only do we not recognize them by naming streets, parks or cities after them; some are altogether forgotten. They are only known to few and their names are buried only in the history books. There are no monuments, no towns, no cites named after King Ashoka, Raja Porous, Raja Jaipaul or Maharaja Ranjit Singh yet there are a number of Sikanderabad and Sikanderpur in Pakistan, honoring Alexander the Great. A large number of followers have expressed their views about the level of admiration bestowed upon so-called Islamic rulers (Turkish and Afghan) in India, relationship between native converts and invading Muslims and overly ambitious attempts to accept some of them as heroes. This is the story of a forgotten hero who fought all his life against the Turkish/ Afghan rulers and in all likelihood was a Muslim of sub-continent origin. Most people might have never heard of his name because of no folklore, no epic, no mention in the textbooks and no street/ town/ city is named after him. He is considered one of the leading gorilla leader of the fifteenth century who fought for and along with his people, perfected the art of war in that terrain and gave Turkish ruling elite a taste of their own medicine. His name was Jasrat alias Jassa. The invasion of Timur exposed the hollowness of Delhi Sultanate in north India. A large number of leaders of native rose up and some even supported Timur out of disgust for Sultanate. The chief of Khokhar (Gakkhars according to some historians) tribe named Shaikha was one of them. After the fall of Delhi at the hands of Timur, Shaikha defected and captured Lahore. Timur recaptured Lahore on his way back from Delhi, got Shaikha beheaded on March 5, 1399 and took his son Jasrat to Samarkand as a captive. After the death of Timur, Jasrat escaped from his prison, returned home, assumed the leadership of his tribe and set himself up at Sialkot. This was the beginning of a remarkable career, lasting almost 40 years, which began during Mahmud Tughlaq reign but most of it occurred during the reign of Syeds (Sadat) Sultanate. His first act was to side with Shahi Khan against Ali Shah in the civil war in Kashmir. The backing of victorious Shahi Khan made Jasrat powerful and well equipped to conceive of conquering Delhi. He was joined by another great rebel, Tughan Rai, who had just lost a rebellion against Syed Khizar Khan (Founder of Syeds Sultanate). Together they swooped across the rivers Ravi, Sutlej and Beas and defeated the governor of Ludhiana, Rai Kamal-ud-din Firoz at Talwandi. 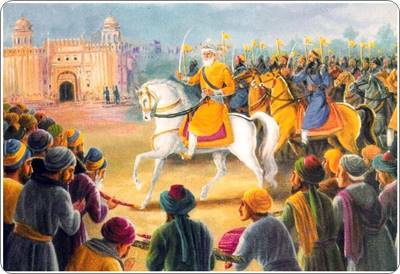 Encouraged by the victory, he captured areas as far as Ropar and laid siege to Jullundhar. The new Sultan, Syed Mubarak Shah moved against him in October 1421, retaking most of the area from Jasrat but failed to capture him. In the next act of his career, he assaulted Lahore in May 1422 with a large force which apparently he had no difficulty in collecting from his hideout in the hills surrounding Jammu (an indication of widespread discontent and frustration with the rulers). He tried twice but each time was defeated by Lahore governor, Mahmud Hassan, with help from Raja Bhim of Jammu. In April 1423, Jasrat emerged from his abode, attacked Raja Bhim of Jammu (a supporter of Sultanate) and killed him. Not only did he remove a thorn from his side, but also took possession of large reserves of arms and treasure, increasing his strength. With a force of 10,000-12,000 strong, he sacked Lahore and Dipalpur. When governor of Punjab, Malik Sikander Tuhfa encountered him with a much larger force, Jasrat promptly withdrew from the contest. In 1427, he saw a window of opportunity when royal armies were busy in quelling the uprising in Mewat and Bayana. He appeared from his hideout and laid siege to Kalanaur. The Sultan deputed a large army against him but just before its arrival, Jasrat retreated to his abode. In 1430, a slave of Syeds, Faulad Turkbaccha, revolted against Syeds, allured ruler of Kabul, Shaikh Ali, for help. The Khokhars, under the leadership of a minor leader Ain-ud-Din joined Shaikh Ali during his attacks on Punjab, Malik Sikander Tuhfa and Syeds Sultanate. Taking advanatage of the weakened Sultanate position, Jasrat reemerged from the hills, crossed rivers Chenab, Ravi and Beas, defeating Malik Sikander Tuhfa at Jullundhar in 1431. He arrested Malik Tuhfa and recaptured Lahore. As usual, when Sultan marched from Delhi with a large force, Jasrat had no option but to withdraw. As soon as, Sultan withdrew and moved his armies to Gwalior and Bayana to quell another rebellion, Jasrat captured Lahore for the third time in 1432, from remaining Sultanate armies. And once again he had to retreat with the arrival of fresh Sultnate armies. In 1433, Sultan Syed Mubarak Shah replaced Nusrat Khan with Allahabad Kaka Lodhi as the governor of this region. Jasrat, immediately took the advantage of changeover, marched to Bajwara and defeated the new governor. Sultan Syed Mubarak Shah was assassinated in 1434. The rise of Bahlol Lodhi that ultimately led to the changeover of Sultanate from Syeds to Lodhis also marks an end of a remarkable career of Jasrat. He was getting old and saw no chance of fulfilling his dream of eliminating the yoke of Turkish/ Afghan rule over sub-continent. As a last resort, he made a pact with Bahlol Lodhi promising not to interfere with Bahlol’s design to capture the throne in return for Bahlol not attacking Jasrat’s people and hometown on both sides of lower river Jhelum. Jasrat died in 1442. “In spite of well over three centuries of almost unbroken rule, the famished Indian peasant wrote lungi and ate khichri and frequently shifted his hamlet and village to avoid the wrath of nature and the tyranny of the state. He (the people) lost all sense of pleasure, his genius was stunted, his mind was subdued and his heart became rude” noted Babur, on Indian affairs from the epitaph of the Delhi Sultanates, in Babur Namah. What he and his descendants did to Indian peasants is another story, a story of almost equal disappointments. Was Jasrat a hero, a rebel or both? Do we really need a historical hero of native origin for identity in an atmosphere that accepts past heroes only of non-native origins? What is the problem to which Jasrat as a hero is the solution? It is for the sake of integral identity; an identity with a lion share of peoples’ heritage. A thorough brainwashing with the help of textbooks, media, teaching and believing only from victors’ standpoint has taken place. Additionally, removing all references of masses resistance and a strategy of silence about the stories of leaders who stood up for the rights of their people has resulted in recognition of rulers like Mahmud Ghaznavi, Ahmad Shah Abdali and Aurangzeb as heroes. Their imposition as our heroes is unfair to our traditions and heritage. Here was a man who symbolized the people’s struggle against tyranny and foreign yoke as much as Shivaji did two centuries later. While Shivaji’s name is written in gold in the annals of people’s history of India, Jasrat’s is completely ignored in Pakistan. Jasrat was to Sultanate what Shivaji was to Mughals. Reading about Jasrat from several well-known history books, one finds no mention of religious differences among his followers. He was popular not only among his tribe but his successful activities in central and eastern Punjab suggest his popularity among other tribes also. He was against foreign rulers who were demanding lot more in taxes and tributes from his people than they could afford. This episode of our proud history of people’s resistance is lot more than providing us with a hero. More importantly it illustrates, irrespective of their beliefs, the frustration and disgust with the rulers who were using ruthless coercion to an extent that a significant number of people were willing to take up arms and getting killed instead of acquiescing to the demands of Turkish/ Afghan rulers. From Mahmud Ghaznavi to Aurangzeb and even till 1947, the story is same. Whatever coercive means the ruler would have access to; would be applied with full fury. Whenever, the people found even a slit in the window, they jumped on the opportunity. Great monuments, Taj Mahal, Badshahi Mosque or Shalimar Gardens, beautiful they are, provide very limited satisfaction, pride or identity. A barely scratching of the surface of one-sided history affords the coercive mechanism of worst kind underneath the rosy top. If this article has any merit, it raises a million-dollar question. Why then so many people chose to convert to the religion of coercive rulers? A partial answer is to be found within the question itself. The effects of prolong coercion spreading over several generation results in the most suitable means to cope with the situation. Suppose a benefit of 20 was distributed by a ratio of 17:2:1 between Turkish/ Afghan Muslims, Muslims of sub-continent origin and non-Muslims respectively, it becomes attractive to be part of 2 rather than 1. Many people belonging to 2 ultimately would try to join the 17 by cooking up non-sub-continental heritage. A simple case of trying to become fittest for better survival. Other modes of conversion included influence of the Sufi who modified their message in a way more acceptable to people, hoping for a rise in the social status in an extra-caste system and forced conversions. In the beginning conversion really did not mean much and communities remained indistinguishable based on customs and traditions as the Jasrat episode suggests. During the times of Guru Nanak, people moved between Islam and Nanak’s teachings without resulting in any major rift. For this very reason, Guru Nanak was able to preach with ease and many Muslims and even several Western writers consider Nanak to be a Muslim Sufi with extreme wahdat-ul-wujood (oneness with God) to a level of complete disregard for Sharia’at (Muhammad’s teachings). A clear split between Muslims of Indian origin and non-Muslims started to appear during Mughal rule and the gulf appears to be widening ever since. In the case of conversions to any religion in India, neither religion nor converts are to be blamed and the descendants of the converts are not guilty of anything in this regard; none whatsoever. A poor peasant or an artisan converting for any of a number of reasons has nothing to do with the crimes against humanity perpetrated by a group of people who happened to be Muslims. No Pakistani should be blamed for the miserable conditions of the past, created by the ruling elite, unless and until he/she ardently defends the cruelties of Turkish/Afghan Empires of India, in effect, reproaching his/her own forefathers.